STEERING GEAR SHOULD BE CHECKED AT LEAST ONE HOUR PRIOR DEPARTURE FROM PORT. THE DUTY OFFICER AND THE SENIOR DUTY ENGINEER SHOULD CARRY OUT THE TESTS TOGETHER. TELEMOTOR TRANSMITTER OIL LEVEL TO BE CHECKED. PALLESTER BEARING AND BOTTOM SEA GLAND CHECKED AND GREASED. ALL LINKS ON STEERING GEAR CHECKED TO BE IN ORDER. FIRST ONE PUMP IS STARTED FROM THE BRIDGE AND THE WHEEL TURNED FROM PORT TO STARBOARD TO CHECK THE TELEMOTOR RESPONSE. NEXT WITH BOTH THE OFFICERS IN THE STEERING FLAT THE WHEEL IS TURNED FROM HARD-A-PORT TO HARD-A-STARBOARD AND THE RUNNING CHECKED. CHECK MADE TO SEE IF THE HELM ANGLE INDICATOR ON THE BRIDGE AND THE LOCAL MECHANICAL ONE CORRESPOND TO EACH OTHER FOR ALL POSITIONS. THE FIRST PUMP IS SHUT OFF AND SECOND ONE IS STARTED AND CHECKS 8 AND 9 REPEATED. THEN BOTH THE PUMPS ARE PUT IN PARALLEL OPERATION AND CHECKS 8 AND 9 REPEATED. AFTER TEST IS SATISFACTORY ONE PUMP IS SHUT OFF. WITH ONE PUMP RUNNING AND IF IT’S OF HELESHAW TYPE, IT SHOULD BE ENSURED THAT THE WHEEL IS ACTUATED EVERY 15 MINUTES, SO THAT THE PUMPS PARTS GET PROPERLY LUBRICATED. 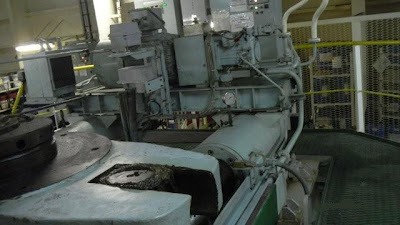 OPERATION OF AUXILIARY STEERING GEAR AND USE OF THE SECOND PUMP, WHICH ACT AS AN AUXILIARY. OPERATION OF REMOTE CONTROL (TELEMOTOR) SYSTEM OR SYSTEMS FROM MAIN BRIDGE STEERING POSITIONS. OPERATION OF STEERING REAR USING THE EMERGENCY POWER SUPPLY. THE ALARMS FITTED TO THE REMOTE CONTROL SYSTEM AND THE STEERING GEAR POWER UNITS SHOULD BE CHECKED FOR CORRECT OPERATION. DURING THESE TESTS RUDDER SHOULD BE MOVED THROUGH ITS FULL TRAVEL IN BOTH DIRECTIONS AND THE VARIOUS EQUIPMENTS ITEMS, LINKAGES, ETC., VISUALLY INSPECTED FOR DAMAGE OR WEAR. THE COMMUNICATION SYSTEM BETWEEN THE BRIDGE AND THE STEERING GEAR COMPARTMENT SHOULD ALSO BE OPERATED. ONE HOUR BEFORE PICKING UP THE PILOT, THE SPEED SHOULD BE REDUCED AND ENGINE MANEUVERS AND ASTERN RUNNING CHECKED. ALSO STEERING GEAR ACTUATION CHECKED. BOTH PUMPS ARE PUT ON AND MOVEMENT ON EITHER SIDE CHECKED. HELM ANGLE INDICATOR AND THE LOCAL INDICATOR IN STEERING GEAR COMPARTMENT CHECKED FOR CORRECT AND MATCHING RESPONSE ON EITHER SIDE.